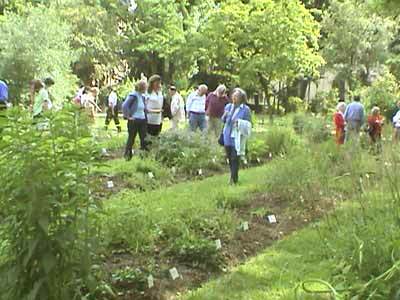 I giardini Demidoff - FLORENCE LIVE! The large estate adjoining the Uccellatoio, or bird trap, was purchased in 1568 by Francesco I dei Medici, who commissioned Buontalenti to build a splendid villa (1569-1581), for the use of Bianca Cappello. Surrounded by a large park of fir trees, the palace had on its ground floor a complex of artificial games with automata, water displays and scenes decorated with ancient statues, mother-of-pearl, semi-precious stones and quality marble. The surrounding park was also imaginatively furnished with various delights, including monumental fountains. Most of these contraptions were designed by Buontalenti himself. The park was divided by an axis coinciding with a major road that seemed to be the only regular feature of an area of caverns, crevices and generally uneven terrain. The main north-south axis, which connected the two parts of the park, at the centre of which the villa stood, was characterised by water, the most important element of the estate and indeed a symbol of the entire park. The water was taken from the Fountain of Jupiter to the so-called "Washerwoman's Pool", then continued through the "Park of the Ancients", the villa of Francesco I and the "Park of the Moderns", highlighting the central feature: the Colossus of the Apennines. This statue, the most noteworthy original work in the park, is a huge statue sculpted by Giambologna. In the lower part is a hexagonal grotto from which steps lead up to the chamber created in the upper part of the body and the head, to which light is admitted through the apertures of the eyes. On the outside the statue is decorated with sponges and limestone concretions, from which water would flow into the pool below. A large laurel maze once stretched out behind the Appennino, as the colossus is commonly called, while the lawn to the front used to be lined with twenty-six ancient sculptures. The various architectural elements in the park were identifiable by sensorial perception, stimulated by the sound of the water and artificial rain. Statues and water supply systems began to disappear from Pratolino in the 17th century, despite the fact that it was a cultural model imitated throughout Europe. The complex, which was too costly to maintain, fell into a period of decline under the Lorraine. 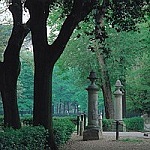 Many of the statues were transferred to the Boboli gardens in Florence, and the park became a game reserve. Pratolino's seemingly inexorable decline was halted in 1819, when grand-duke Ferdinando III of Lorraine transformed the splendid garden from the Italian to the English style, with the help of the Bohemian engineer Joseph Frietsch. This design choice enlarged the display areas at the expense of cultivated land and the park grew in size from twenty to sixty-eight hectares. What was left of the park designed by Buontalenti was successfully re-landscaped to form the new park. In 1822, engineer Joseph Frietsch also oversaw the demolition of the palace. the Mugnone fountain, the statue for which was sculpted by Giambologna (1577); the Maschera fishpond, used also as a swimming-pool and adapted for hot baths; the large aviary; the pheasant house; Cupid's grotto, designed by Buontalenti in 1577; and the Neoclassical Montili lodge, built around 1820 by architect Luigi De Cambray-Digny. The park also contains centuries-old oaks, cedars and horse chestnuts, which are every bit as impressive as the man-made monuments.